Majority of the Hindu temples in India have huge trees or sacred groves in its vicinity. Nowadays, with rampant commercialization of temples these trees and sacred groves have given way to concrete buildings. With each tree cut and each sacred grove cleared, the indigenous wisdom about a plant’s medicinal properties is lost forever. Most of these temple trees are noted for its medicinal properties and sacred groves are a well known source of Ayurvedic medicines. Sadly, no significant scientific research has been done on trees found in the vicinity of Hindu temples. Scientists at the M.S. 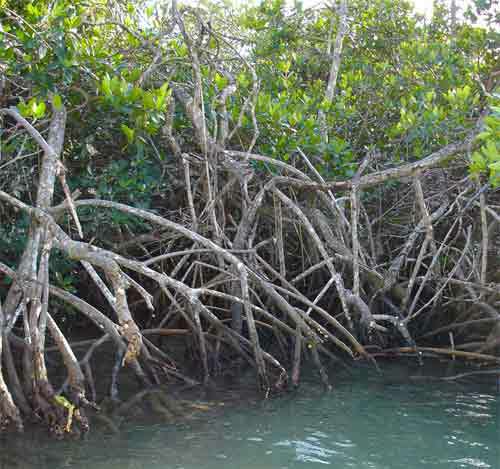 Swaminathan Foundation for Research found that compounds in mangroves could cure several diseases. The thillai tree, a mangrove species, is worshipped in the famous Chidambaram Nataraja temple. The thillai tree sculpture in the temple dates back to the second century A.D and it is believed that a dip in the Chidambaram temple tank will cure diseases. Pichavaram Wetlands, near the temple, is noted for large number of Thillai trees. Though it is too early to say if researchers will strike pharmaceutical gold, an initial screening of 'thillai' extracts indicates the presence of compounds with anti-HIV, anti-cancer and anti-viral properties. These compounds are also active against mycobacteria – microbes that cause diseases like leprosy and tuberculosis. Mangrove extracts could lower the use of chemicals in pest control. Despite growing in wetlands, the leaves of the thillai have few larval infestations, indicating the presence of terpenoids that act as natural pesticides. Some mangrove species inhibit the growth of mosquitoes.